Books have been written by better writers than I about how to deliver a remarkable experience that your clients tell others about. One of those writers is Seth Godin. In his book, Purple Cow, and in his blog, Seth's message is pretty simple: To be remarkable, do something worth making a remark about. "Kevin, it's Seth Godin. Thanks for your super-nice note. Just wanted to let you know I got it. Have a great weekend." That was Seth, calling to thank me for a letter I mailed him, in which I thanked him for a remarkable presentation he made at an event I attended. I want to thank you for your presentation last Wed. at Jay Abraham's Reunion Reunion. Your ideas were both inspirational and practical -- an ultra-rare combination. I especially liked what you said about curiosity -- how it is essential to success and how a fundamentalist looks at the world to see how it fits what they believe, while a curious person looks and changes what they believe, as needed. I am now paying a little more attention to how I look at the world. Turns out, my writing and mailing an out-of-the-ordinary note was remarkable enough to Seth that he called to say, "Thank you" in return. Now, I'm remarking about Seth's remarkable action here on my blog. Best part: You can start your own remarkable virtuous circle by doing something for a client today that's worth making a remark about. Why not start by writing or saying, "Thank you"? Which Clients Should You Clone? Referrals from current clients will buy from you faster, easier, and more profitably than total strangers. Up-selling ("Want to supersize that?") and cross-selling ("Want fries with that?") to people already buying are faster, easier, and more profitable than selling to cold prospects. But, with power comes responsibility. Inside marketing works so well that you must pick your targets carefully. However you decide which clients to clone, the important thing is to decide. Once you form a clear picture of your ideal clients, fun things happen. Building your business becomes faster, easier, and more profitable. This week, ask 3 successful entrepreneurs to describe their ideal client in detail. You will likely get a lot of detail. Then, ask 3 unsuccessful entrepreneurs to describe their ideal client in detail. You will likely get a lot of blank stares. Meanwhile, know this: You can't get more clients like your best clients until you know who your best clients are. 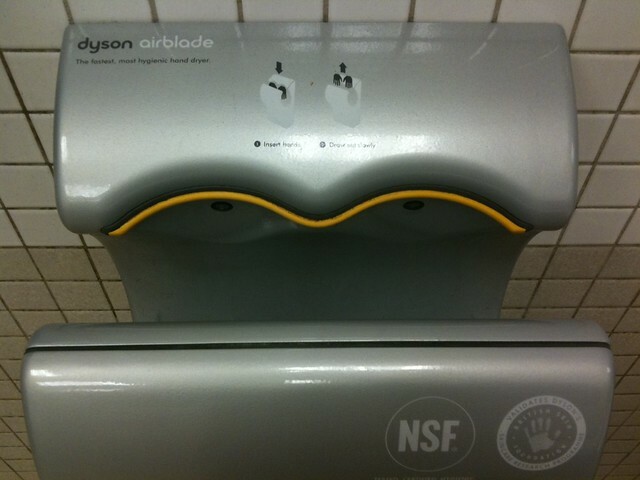 Ever use one of these Dyson Airblade hand dryers? Even more striking than the design is the process. And how well does a Dyson work? Fantastically. By focusing warm air into a tiny sliver, the Dyson completely dries each part of your hand that passes through it. Slow and focused beats vigorous and unfocused. Now. What about your marketing? Could the same rules apply? Do you ask them qualifying questions, to gauge their interest and needs? Do you follow a script in the words you say or write to get the sale? And, most importantly, do you have a follow-up process to "touch" prospects at least 5-10 times after their initial contact with you? In other words, is your marketing a slow and focused process? Or ... do you wing it from start to finish -- sending emails and tweets, making phone calls, and following up whenever you have the time? In other words, is your marketing a vigorous and unfocused mess? Just like using a Dyson Airblade for the first time, it feels strange to put your prospects through a slow and focused process: qualifying questions, scripted presentations, disciplined/automated follow-up, etc. But here's the good news: The "slow" method of drawing prospects through a focused marketing process will convert more of them into paying clients than a similar amount of vigorous, unfocused activity. And you won't have to wipe your hands on your pants. If you know the 80/20 Rule (aka the Pareto principle), you know that a minority of causes usually leads to a majority of results. In other words, only a few things matter. Most things don't. My corollary on that idea, 80/20 Marketing, holds that only a few things matter in your marketing. Most things don't. That last figure is important. Because, if 20% of your marketing produces 80% of your profits, then 80% of your marketing is largely a waste of time and money. Most of your marketing doesn't matter. Want to know one area that DOES matter? A "20% area" of high leverage and high profit? That vital area of your marketing is conversion. Conversion is everything you do to convert browsers into buyers and relationships into sales. If you've taken the time and money to initiate a relationship with someone who can either become a client or refer a client, you need to take that relationship as far as you can, as fast as you can. In other words, do everything possible to turn leads into customers. And, one of the easiest and most effective ways to convert more leads is to mail them thank-you notes. It's so effective, it can make your business entirely referral-driven in a matter of months. Thank you for talking with me on the telephone. In today's business world, time is precious. You can rest assured that I will always be respectful of the time you invest as we discuss the possibility of a mutually beneficial business relationship. Thank you. It was a pleasure meeting you, and my thank you is for the time we shared. We have been fortunate to serve many happy clients, and it is my wish to some day be able to serve you. If you have any questions, please don't hesitate to call. Thank you for giving me the opportunity to discuss with you our association for the mutual benefit of our firms. We believe that quality, blended with excellent service, is the foundation for a successful business. Thank you for giving me the opportunity to offer you our finest service. We are confident that you will be happy with this investment towards future growth. My goal is now to offer excellent follow-up service so you will have no reservations about referring others to me who have similar needs as yours. Thank you for your kind referral. You may rest assured that anyone you refer to me will receive the highest degree of professional service possible. Thank you for taking your time to consider letting me serve you. It is with sincere regrets that your immediate plans do not include making the investment at this time. However, if you need further information or have any questions, please feel free to call. I will keep you posted on new developments and changes that may benefit you. Thank you for taking your time to analyze my services. I regret being unable, at this time, to prove to you the benefits we have to offer. We keep constantly informed of new developments and changes, so I will keep in touch with the hope that in the years ahead we will be able to do business. Thank you for your gracious offer of giving me referrals. As we discussed, I am enclosing three of my business cards. I thank you in advance for placing them in the hands of three of your friends, acquaintances, or relatives that I might serve. I will keep in touch and be willing to render my services as needed. Thank you. It is gratifying to meet someone dedicated to doing a good job. Your efforts are sincerely appreciated. If my company or I can serve you in any way, please don't hesitate to call. Thank you. It is with warm regards that I send this note to say hello and again, thanks for your past patronage. We are continually changing and improving our products and services. If you would like an update on our latest advancements, please give me a call. Instead of struggling to forge relationships with new prospects every day, why not make the most of the relationships you already have? There's nothing to download, no new skills to master, and it takes about 20 minutes a day. "The power of expressed gratitude is immense," according to Tom Hopkins. And he's right. Why not put the power of this simple sales tool -- thank-you notes -- to work for you? It's a proven way to build your business by converting more relationships into sales, using high-value, 80/20 Marketing. You've heard it said that the perfect is the enemy of the good. The perfect is the enemy of the better, and it's also the enemy of improvement. Because, when we fret and fume over why something isn't yet perfect -- and probably never will be -- it's depressing as hell. And depressed people don't take action to make things better. Depressed people watch TV, check Facebook, or drink coffee/beer/martinis. So, just for the rest of today, screw perfection. It may be the most productive thing you do all week. Here's why: A little better is a lot better than not better. 1) "A little better is ..." making one small improvement to whatever you're doing. One small change for the better. One. Small. Improvement. The fun part is, you may not stop at one. You may find that improving your marketing emails, customer support, blog, web site, or prospect follow-up is so enjoyable that you keep going until you create a wholesale makeover. But you can't finish what you don't start. And starting is the hard part. So make your start small, with the goal of simply trying for a little better. 2) "... a lot better than not better" is the other side of that equation. If the daunting goal of perfection has kept you from starting, guess what? You won't start. You won't improve. That article you need to write, PowerPoint you have to create, or proposal you must submit won't happen by itself. Taking no action can NOT make anything better. That's how the perfect really is the enemy of the better. And that's why a little better is a lot better than not better. Click my goofy-looking face to watch my interview on Fox 9 News. Best Buy CEO Brian Dunn resigned today, and the future of his company is cloudy. Best Buy can survive, but they have to morph into a stronger combination of online and retail stores, selling products and services. They're in a very tough industry with a lot of problems. But they’re also a very rich company, with a lot of assets. One of those assets could turn out to be the key to their future: it’s the Geek Squad. The Geek Squad is the world's largest tech-support operation, and by most accounts, it produces a very big part of Best Buy profits. The founder of the Geek Squad, Robert Stephens, always maintained that he acquired Best Buy 10 years ago, and not the other way around. And he might have been right. He also recognized something very important: Service cannot be commoditized. You cannot price shop on service the way you can price shop on TVs and washing machines. If Best Buy can find a way to deliver more services, whether it’s to consumers, or businesses, or both, that could go a long way toward turning them around. Besides Wal-Mart offline and Amazon online, Best Buy has to worry about Apple. There are Apple products, like the iPad, which is threatening to replace laptops, DVD players, and TVs for a lot of people and that really hurts Best Buy, which sells all those devices. On top of that, visiting an Apple Store is a wonderful experience, while visiting a Best Buy store is ... not. If Best Buy wants more shoppers buying more products and services in their retail stores, they need create a shopping experience that's more memorable -- for all the right reasons. And that’s going to be a big challenge for Best Buy. Bottom line: If you want more revenues, more profits, and less competition, you want to de-commoditize the products you sell and create an experience for your clients. Update: Check out this July 5 story in The Wall Street Journal to see how Best Buy is trying to deliver the high-profit shopping experience of Apple, which I suggested above. Do Best Buy executives read my blog? Hell no. But a good idea is a good idea.